Anyone who has run competitively knows what it means to press. Exertion edges past comfort, and you pray for some pleasure in punishment, or at least you hope for an outcome erasing the torture whispering in your brain. When the voice grows loud and insistent, you tell yourself you’re a better person for enduring it, embracing it. But you don’t need to run to know what pressing is. Some of the things you’re sure you want, you don’t want… and vice versa. You know—because you’ve been told—choosing to travel downstream means never seeing the mountains. If you do more than you think possible, you’ll redefine what possible is. What does not destroy you… oh, you know the rest. Yet my most rare pleasure is doing what occurs to me. I’m surprised when I find myself enjoying, without guilt or self-recrimination, some activity I wandered into. I’m happy for each break from thought and action. As a child I occupied time, and not in the way I use that expression now—as expending or wasting time before important events—but in the gentler sense of dwelling in and on the present’s comforts. The line between relentless determination and masochism grows fuzzy. In the marshmallow test, the contest goes to the child who leaves the first sweet alone in anticipation of two later. The children who only want one, we’re told, go on to lives of mediocrity. Yet, the test seems biased. What if there truly is no time like the present? By what measure of success are the satisfied unsuccessful? What if contentedness is the ultimate success? Today, like every day, I’ve jotted a list of what must be done. The day’s value comes from the number of check marks added to that list. Anything else distracts. Three phone calls, emails to answer, and every variety of follow-ups await me. Even this post makes the list—creativity becomes production. Because moving is crucial, every minute demands gripping the road, making progress on projects… whatever “progress” and “project” mean. Though I recognize forces of instant gratification working in the world too, I’m of the bigger-better-faster generation. We’ve been conditioned to distrust comfort and complacency. We’ve been led to believe we’re useful only when we expend breakneck effort. Anything easy, my parents taught me, is not worth having, and, hence, I’ve come to believe less (and less) in accomplishments. Once attained, they tell me I’ve aimed too low. Having makes me wonder about something more, harder, more worthy. I’m not alone. We’ve forgotten how to rest. We want to devise, institute, adjust, amend, alter, generate, or overturn. Our phones are out and we’re doing and doing. We nurture hope the next moment will be better (or at least different). The present is perpetually incomplete. No subject or object can be left alone. Because we’re a half-turn from bringing everything into a more fulfilling alignment, we spin and spin. I worry our addictions to novelty and progress will disqualify the value of the past. We seldom, if ever, consider what we give up. We miss the repeated lesson that heedless innovation produces unanticipated, often complicated and ambiguous, results. Despite our technology and sophistication, we remain animals who so fear being prey they don’t dare pause. We exhaust ourselves to attain some safe state of relaxation that never arrives. Herds of lemmings, I understand, don’t really rush off cliffs… but we may if we whip ourselves into a dead run where we’re frantic, exhausted, and addled. Satisfaction and consummation obsesses us, but when do we have enough? Some ambition is necessary—we have problems to solve, and that takes dedication. And I’m not against a runner’s type of pressing if your motive is to test your capacities, exercise your talents, generally revel in the blessings of being alive and strong. I’m all for the glory of that sort of effort. Yet, past a point I wish I could better define, ambition begins to look like compulsion, the twitching of a rabid mammal. Can’t resting be glorious too? During NBC’s broadcast of last Saturday’s USA Track and Field Championships from Des Moines, just before the gun to start the mens’ 400 meter final, the screen fills with each participant, lanes two to eight. Ato Boldon, who does color commentary, offers each athlete’s resume, and, in lane five, he introduces Tony McQuay, former Florida Gator, silver medalist in the 2012 Olympic 4 x 400, and one of the race favorites. McQuay finishes second. I was there. In fact, if you pause your DVR at just the right moment and scour the spectators in the second row (just to the right of McQuay’s left ear) you’ll see my daughter leaning toward me. I’m wearing a Columbia blue cap—nearly white in the glare—and sunglasses. We watched the runners’ backs, and two pairs of cameramen and cord handlers played leapfrog as they rushed past the runner on screen to the runner next to appear. One pair had odd lanes, the other even. They deftly reached their spot and froze, listening through earbuds to commentary we couldn’t hear, gathering and playing out cord as needed. Just before the runners took their blocks, they scurried into the narrow alley between track and stadium wall, dragging line behind them. One dropped his camera on a tripod to capture the opening strides. Perhaps you anticipate where I’m headed. As much as I enjoyed being at the championship (the tickets were a birthday gift from my daughter), I sometimes felt we real spectators were secondary. I remember the cameramen well not only because I saw them more clearly than the runners but also because everyone seemed hyperaware of them. 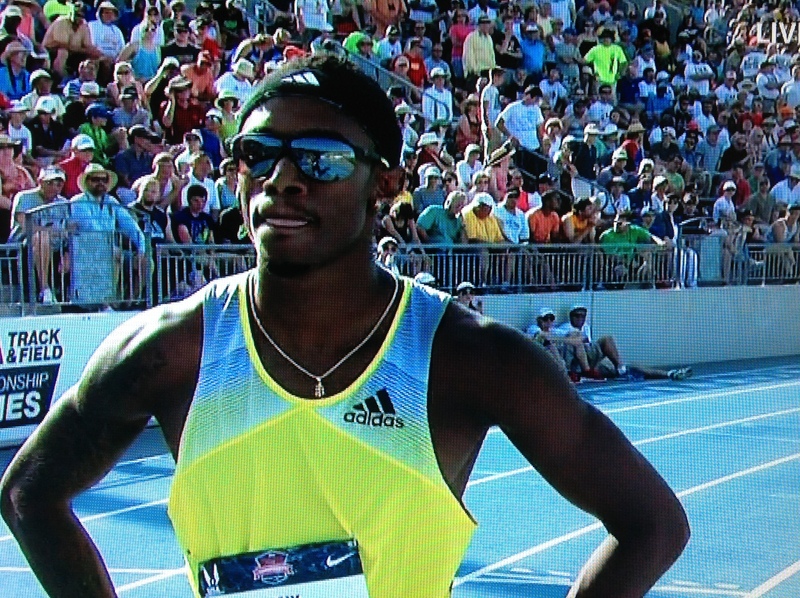 The crowd booed if the cameras intruded by lingering overlong, and, the day before, fans yelled at one of the cord handlers when he left a loop on the track as the athlete ran up in that lane. Though he yanked it out, it seemed a close call. In track—as in many sports, I suspect—TV coverage beats being there. Being there, you feel the tension and anticipation of the big moment. You see the subtle expressions of athletes’ off-camera demeanors. The excitement of the crowd and athletes is viral. However, most races are blurs. With the limitations of the human eye to discern depth and distance, it’s tough to tell what’s happening on the far side. You can’t even tell who’s leading down the home stretch because you only have one angle. You also wonder what television sees and you miss. When cameras eye their own monitors they discover tunnels of frames, a narrowing hall into infinity. Similarly, at a “live sporting event”—an odd label in itself—you fall prey to postmodern disassociation. It’s all about watching. And as I watched, I felt myself watching. If I’d had a portable TV, I might have seen myself and waved at myself waving. The first time I went to one of my older brother’s high school meets under lights, I could hardly wait to go down onto the track and sprint between its lines. The moment, and place, seemed charged with glory. In Des Moines, some of the same urgency beset me, but usually during un-broadcast junior finals or deep prelim flights. Otherwise, I was strangely confused. Why were we there? Were we actors in the broadcast? My living room is certainly cooler and my favorite chair more comfortable than a bleacher bench. The food is better at home. The cameras were licking up the image of his body, were recording his every movement and noiselessly hurling them into millions of TV screens scattered around the world—into rooms, cars, boats, planes, living rooms, and bedrooms. He would be seen by more people than he could ever meet in his entire life—people who would never meet him. The people who watched him on their sets did not know who actually faced them; how could they, if they had never met him? Television reflected only people’s surfaces; it also kept peeling their images from their bodies until they were sucked into the caverns of viewers’ eyes, forever beyond retrieval, to disappear. Forget my 1.5 seconds of fame—no one watches track!—if I felt licked up and/or peeled what about those at the center of this contest? And why stop with this meet or this medium? What does it mean to become an image, to distill experience and serve it so neatly? What about the living event? Soon people will begin asking whether I enjoyed myself, and I’ll answer, truthfully, “Yes.” Yet, part of me wonders what I experienced, how much was real at all. Now it’s spring break, and I’m really just starting to run again. Ramping up has been harder than expected—the ramp is steeper than it would have been if I hadn’t said “no” to treadmills and so much Chicago weather—but age and weight also make me feel like a plodder, earth-bound when, even two years ago, I could at least occasionally fly. During my running prime, in my late 20’s and early 30’s, I was 25 pounds lighter. I was so cadaverous that a friend seeing me at a start line for the first time in a long time said, “Man, you look great! You look like they just dug you up for this race!” It’s crass to say how fast I ran that half-marathon, but I broke my ten mile personal best during the 13.1 mile race. After the finish, the friend and I ran a seven-mile cool down together. Now, out for three or even two miles, I await the feeling every committed runner knows, the sense your brain and not your body matters most. When you’re in shape, no distance seems impossible at the right pace, and no pace seems impossible with proper training. You don’t dread the day’s workout because it has become easier to run than not to and because, at a certain level of fitness, it’s fun discovering how much you can do. People say the key to a long running career is simple—Don’t Stop—and the truth of that advice comes from winning that invulnerable mentality and clinging to it. You don’t want to rebuild. But I’m rebuilding. My edifice looks mighty rickety right now. Chicago has been cruel. The last few days, my first week of “spring” break, the temperature has hardly climbed above 30°. The wind gusts and, heavy as I am, seems to throw me off my feet when I round a corner or cross an intersection. The clothes this weather requires are long de-elasticized and/or missing, so I run in shorts and return with my thighs red and numb. I’m wearing socks for gloves. I’m leaden. I’m sore. I have blisters. Time crawls from mile to mile. I’d shake my fist at the sky, but I’m too tired. If you’re my age and complain about how hard running is, people offer some variation on “Humans weren’t meant to run.” However, a lot of anthropologists actually believe evolution favored distance running and explain our upright posture as evidence runners among us survived tree-dwellers. Sure, cheetahs and antelopes are faster, but humans can (and do) run such sprinters to death, pursuing until exhaustion makes prey vulnerable. In college, I watched a film about a bunch of Kung Bushmen running a giraffe down over days. The cameraman eventually shot the giraffe because he’d used most of his film, and the tribesmen were still at it. Our leg length relative to body mass, the energy stored in long tendons and muscles, our lung cavities, the shortness of our arms, all allow us to move efficiently, with minimal expenditure of effort. Or ought to. In the African bush, I’d be on the menu rather than dining. I understand someone attributing my running renewal to vanity or some pathetic mid-life battle with mortality. Maybe I should be playing golf—though no anthropologist has unearthed any ancient clubs yet. Perhaps I’m simply sublimating my self-loathing. But, as awful as training is right now, I remember better days, days I’d love to restore not because they would remind me of my youth or former glory, but because, to me, running once felt good, felt natural, felt right. And I like to think life is an endurance race and not a sprint. That’s a rare perspective these days. This fall, for the first time in a long time, I’m not coaching cross country. I was head coach for ten years at my old school, and I’ve been an assistant coach for the last few years here in Chicago. Recently I’ve been largely responsible for moving athletes from one place to another with a well-placed “Let’s go guys”…and was damn good at it. I’ll miss being called “Coach,” but I don’t expect to stop coaching. Teachers, after all, are supposed to be coaches. This vision of teacher-as-coach is gratifying. You stand in a student’s corner and shout, “You can do it!” You praise moments of triumph and soothe aches and pains. You are a cohort who urges promising young people to achieve mutually agreed-upon goals. Coach-teachers cast aside the old-school models of instructors who disseminate information on a take-it-or-leave-it basis. A coach, well, a coach inspires. But that’s not a coach’s only role and being a teacher-coach seems so much more complicated. My seventh grade gym coach, Mr. McGuiness touched my shoulder when he passed back rules or health tests I aced, nodding and winking to say “Well done.” He helped me up after humiliating moments—like the time, running between first and second base, I foiled a double play with my forehead. He asked again and again, between laughter, if I was okay. He got me involved in running because, I suspect, he thought it would help my self-confidence if I could find athletic success somewhere. Yet even the sainted Coach McGuiness could be cruel…and meant to be. As a track coach, he prepared athletes for events administered by third parties—he readied athletes for contests decided by objective designations like “first” or “fifth,” “cleared” or “missed,” “victory” or “loss.” He knew the rules were out of his hands and the end result up to the athletes, so he had to be tough. It wasn’t impossible of course, but it’s a reasonable question. In the past, when I answered, “I want your success to mean something,” or “It’s not me, it’s the standards that are challenging,” they countered, “Don’t you make the standards?” If, after Sizer’s coaching, Susan received the comment, “Your paper was as wooden as the outline, but still sensible and sturdy…a thoroughly adequate essay,” she might cry foul too. But what if his assessment was honest? When I was a head cross-country coach, once a season we played a running game called “Knock Out.” In this game the runners started on the same start line and ran a half-mile loop and then rested. Every six minutes, we’d start another loop. The wrinkle was that the last one or two people to finish each half mile didn’t line up for the next repetitions. Those athletes ran the loop in the opposite direction, and kept running, without a rest, until the game was over. On the first half-mile, the runners clumped, playing it safe, not wasting energy in the front or risking elimination behind the pack. As the contest wore on, as more and more teammates jogged in the opposite direction, strategies changed. Soon all the remaining runners wanted to be near the front and, invariably, someone tried to rush to a safe lead and stay there. The survivors grew more and more tired, but the repetitions grew faster and faster. The idea was to develop athletes’ late race determination. It was more objective than “Compose an effective outline.” Once the rules were established, it just happened. No judgment necessary. Some athletes hated the game, and I never felt entirely happy with it either. Win-lose objectivity can be painful, less disputable and therefore more ego-thrashing than rulings I make as a teacher. I just wanted to accomplish something pure exhortation wouldn’t. A teacher-coach who protects students from risky assessments might not be serving students’ best interests. While teachers emulate coaches’ rah-rah, they could also learn from coaches’ unapologetic challenges. I’m not talking about giving low grades—I hate grades and would rather do away with them altogether. I’m talking about assigning trying tasks. Anything that helps students discover their potential prepares them for the future. Ironically, grades often distract students from challenging themselves. Students aren’t focusing on the task when they focus on grades. They aren’t really focusing on outcomes either. They are gathering points and engaging in the most abstract accounting, not facing real and immediate challenges. The other athletes found Tony’s question silly. “He just told you!” they’d yell. What they didn’t understand was that Tony was really asking, “What does the score mean?” Tony wanted to know if we’ve exceeded expectations or fallen short. He wanted to know whether we closed the time gap between our first and fifth runner and if we had improved from our last outing. He needed me to interpret the results. I always wanted to say we’d done well, at least that we’d done better, but sometimes the clocks or the places disagreed. A good coach can figure out what really happened and then cast disappointment in a helpful light. During a writing conference, I have to be honest and point out what’s weakest, but I can also illuminate moments of promise and progress. The best coaches I’ve encountered focus on what an athlete might do next, where improvement lies. You can’t deny what happened, so what do you do with what happened? Late in my running career, I ran into a coach named Mr. Miller. He chuckled at adolescent eccentricities and nicknamed me anew each week. Before each race, he said, “Do your best” with assurance my best would be enough. He met disappointment with explanation. “You went out too slow,” he’d say, or “You need to slingshot off that last turn,” or “In another five yards, you’d have had the next guy.” Sometimes I could tell he was looking for something, anything to say to a fifth place finisher, but the “grade” mattered much less than his support. My true job as teacher or coach (or something between) is inspiring belief in personal progress. I’m a fan of backwater sports history—the stories of figures who held only momentary prominence and slid into footnotes. Their exploits aren’t important or consequential or influential or curious enough to make the hall of fame mainstream, and so they trickle along unnoticed. In the age of the internet, however, their records don’t disappear entirely. Googling finds them waiting. Such is the case with Lewis “Deerfoot” Bennett, a Seneca Native American born in 1830. Presently Ethiopian distance runner Haile Gebrselassie holds the record for the greatest distance traveled in one hour (21,285 meters or 13.23 miles), but, as amazing as that record is, it doesn’t erase the achievements of the great one-hour runners of the past, especially Deerfoot. In the 19th century, when distance running was known as “pedestrianism,” it was more an excuse to gamble than a sport, and professional distance runners would make an audacious claim—”I can run 11 miles in an hour”—and then, one Sunday afternoon or Monday night, try it. As many as 30, 000 spectators might show up to watch them take on other runners and make good on their assertions. Records of these contests go as far back as 1690, but, in the mid-19th century they stirred public imagination and interest. A British promoter and former runner, George Martin, brought four runners to the U.S. in 1861, and in New York State, he encountered Deerfoot, a local challenger who nearly defeated one of his stars. Internet history records only one of Deerfoot’s races before then, a five-mile completed in 25 minutes at the Erie Fair in 1856, when he was 26. He won $50. Martin, who must have known talent, invited Deerfoot to England to race the prominent “pedestrianists” of the day. Over the next 20 months, Deerfoot ran 130 events in 87 weeks—or a competition every four or five days. He lost his first race and his last, but between the two, he never lost. Some stories describe Deerfoot as humble and reserved, but photographs and accounts of the day show him bare-chested and wearing only a breechcloth and a feather in his headband. They also describe him unleashing loud war-whoops during his runs and sometimes scuffling with spectators before and after races. Running spikes were available then, but Deerfoot turned them down in favor of moccasins. The difference between the gaits of the white and the red man was very marked, the former going with an easy cat-like step, and the latter with the peculiar “lope” and side-swing of shoulder and head that any prairie traveler has remarked among the runners of the western tribes. Deerfoot’s form, however was only part of a do or die approach. He threw frequent surges into his races, daring the British runners to match pace. Once in the lead, he sometimes slowed enough to allow them to regain contact and then threw in another burst to put them away. Some of the information I’ve found says that Deerfoot never trained, that the secret to his triumphant tour was that he raced into shape, but I’m skeptical. We find some strange comfort in calling athletes—especially non-white athletes—”naturals,” but Deerfoot’s records are too formidable to arise from running every Monday night. In 1863, Deerfoot ran 11 miles 790 yards in one hour in January, then 11 miles 880 yards in 59:44 in February. He might have had a new one-hour record at that point, but, since the bet was over running 10.5 miles under an hour, he let the last 16 seconds go. When you consider what conditions might have been like at that time of year, these performances are remarkable, but his most astounding race came in April, against William Lang. With a 100 yard handicap, Lang held Deerfoot off for a full ten miles, when Deerfoot finally pulled even at 51:26, the fastest ten mile time at that point. At the end of an hour, Lang beat Deerfoot by half a yard, but Deerfoot’s race, measuring 100 yards longer than Lang’s, was 11 miles, 970 yards, a new one-hour record. That run marked his last race in England. 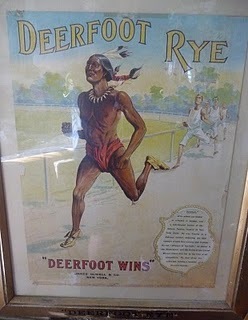 Though two professional runners in the 1890s reputedly broke Deerfoot’s one hour record, the first time a runner broke it officially was 41 years later in 1904 when Alf Shrub—using a strategy very like Deerfoot’s—ran 167 yards further. I don’t mean to denigrate Haile Gebrselassie. He is one of my running heroes, notwithstanding his withdrawal from the Berlin marathon that Ethiopian Patrick Makau won last weekend in a new record 2:03:38, but when you consider the improvement in equipment, in running surfaces, and in training methods, Deerfoot is certainly the finest distance runner this country has produced and perhaps one of the finest in history. Deerfoot died in 1897, and, searching the web, I could only find record of one race during all that time—one in Cleveland in 1869 when Deerfoot, then 39, defeated a visiting British pedestrianist in a five-mile race. Despite giving the rest of the field a quarter mile lead, he won in 24:15, 45 seconds faster than his first recorded race when he was 26. As any runner knows, you can’t do that without training. While baseball fans debate the best pitcher and football fans argue over the top ten wide receivers, I will quietly hold onto Deerfoot, my backwater great. If you are interested in learning more, a book by Rob Hadgraft, Deerfoot: Athletics’ Noble Savage can tell you more. In the meantime, it’s consoling to think his legend trickles through the web, assuring him a measure of the immortality he deserves. A running coach once told me the muscles you use sprinting at the end of a race are different from the ones you’ve relied on before. That’s absurd, of course. But, as the finish line approaches, I summon new belief in the energy I started with. The end of the school year is challenging. The students—especially the seniors—want to be finished and, really, I understand entirely. I know the achy restlessness that makes you unsure of what you want to do… except that, whatever it is, you’re sure it isn’t this. But I wish my students could call on other muscles. I don’t run much anymore. Many former racers probably do what I do: conserve miles instead of spend them. It’s a different way of exhausting your energy, like letting the air out a balloon, slowly, just fast enough, assuring a steady stream, holding back for the last, last, at least somewhat explosive, puff. Husbandry instead of enthusiasm, or enthusiastic self-restraint and control in preparation for the closing moments. As the school year ends, husbandry grows old. In running, the word for an accelerated finish is a “kick,” and the adjective often used to describe a good kick is “furious.” Neither term makes much sense unless you think of a just-shot cowboy kicking as he expires or imagine him angry at the world and getting in his last blows. I hope I’m far from death, but I understand fury, a feeling that visits you, a passion like beating wings, an alien compulsion. In Greek and Roman mythology, the Furies were winged, serpentine goddesses devoted to chasing and punishing people who had not properly paid for crimes, and that is exactly the sort of fury I feel these days when, instead of studying for tests or writing papers due the next day, sophomores chase each other down crowded hallways or shriek over a YouTube video just outside a classroom where I’m trying to teach, or duck into my office in a futile attempt to avoid the latest volley in a got-you-last swatting duel. The trick this time of year is directing fury rather than watching, almost like a stranger, as fury escapes me. I’ve had some angry episodes recently, and each leaves me a little more spent—and a little more resentful—as I try to gather myself to sprint. As a runner, I felt proud of my kick. In my best races, fury accumulated like air-borne electricity, struck like lightning, and coursed down wires to awaken vivid life in me. I wasn’t the sort to drift across the line or swivel to see who might be near me. While I couldn’t always match the speed of others, I took terrible offense at anyone passing me in the last half-mile. My coaches advised, “Be the hunter, not the hunted,” and I wanted that, to be a hunter bearing down on the unsuspecting. The trouble is, I’m older now, and lightning is just as likely to fry an innocent woodland creature as fill a battery. Fatigue erodes discipline. In me, it undermines tolerance. Not everyone has this kick in them. I’m making a point of warning everyone around me—beware, fury is near.